Sleepy Duskywings and Dreamy Duskywings are not lazy butterflies. Their whimsical names refer to their “closed eyes” --- the lack of a stack of white dots at the subapical “wrist” on the leading edge of the dorsal front wing, marks which are found on the four other Erynnis species in Massachusetts, Juvenal’s Duskywing, Horace’s Duskywing, Persius Duskywing and Wild Indigo Duskywing. Recent research suggests that the more southerly Sleepy Duskywing is increasing today in Massachusetts, while the more northerly Dreamy Duskywing is decreasing. The Sleepy Duskywing male was first figured by John Abbot, working in Georgia 1776 -1792 and in Virginia 1773-76. In Insects of Georgia he and J. E. Smith called it the Dingy Skipper Butterfly, but had the host plant incorrect, drawing a legume instead of an oak, perhaps due to confusion with the Wild Indigo or the Zarucco Duskywings (Calhoun, 2006). The species was later more clearly defined by Boisduval and LeConte. It is probable that Thaddeus W. Harris was referring to this species in the 1862 edition of his report (Fig 132; 309-10), since he references the above authorities, but his own drawing is not very clear. Scudder, referencing Harris on brizo, says that “about Boston and in the Connecticut valley south of Amherst it has been obtained by many collectors. Mr. Fish has taken it on Cape Cod” (1889: 1505). F. H. Sprague reports taking six specimens May 22- 23, 1878, in Wollaston near Boston, where he also got three Dreamy Duskywing specimens that year (Sprague 1879). Although Scudder said that brizo was “not so common as other species," Newton naturalist C. J. Maynard asserted (1886) that brizo was “very common with us in Massachusetts." The number of eastern Massachusetts museum specimens supports Maynard. Scudder’s account of Sleepy Duskywing's distribution and habitat relies on the reports of many collectors, and this species was frequently confused with Dreamy Duskywing. For this reason Scudder’s reports of northerly distribution, and of habitat (“moist, shady spots”), are not correct, and probably derive from confusion with Dreamy Duskywing. Scudder did successfully raise Sleepy Duskywing on scrub oak (Q. ilicifolia), thus pinpointing its apparently sole host plant in our area. In the Harvard MCZ are about seventy late 19th and early 20th century Boston area specimens of Sleepy Duskywing -- many more than of Dreamy Duskywing. There are no 19th century Sleepy Duskywing specimens from central or western Massachusetts. Some 37 of the Boston area specimens were re-examined in 1964 by skipper expert J. M. Burns, for possible confusion with Wild Indigo Duskywing; all examined were found to be truly Sleepy Duskywing. The earliest specimens are three from Weston (no coll. ), where "hundreds" were reported flying in April and May, 1874. The next earliest are Sprague's 15 specimens from Wollaston, taken in 1878, 1879, 1884, 1885, 1895 and 1897. (All appear on inspection to be actually Sleepy Duskywing.) From Wellesley in 1890-92 come nine specimens taken by A. P. Morse, along with one from Sherborn 5/19/1895, also from Morse; the ten Morse specimens were determined by Burns to be in fact Sleepy Duskywing. In Wellesley in 1896, the Denton Brothers collected at least two specimens (Denton mounts, MCZ). In Waltham in 1897, C. Bullard took 16 specimens in April and May; all were confirmed as Sleepy by Burns. In the 1920's, C. J. Paine found nine specimens in Weston; again, all were confirmed by J. M. Burns. From the 1930's are ten more specimens from Wellesley and Walpole. By the mid-20th century it became clear that the distribution of Sleepy Duskywing in the state extended thinly beyond just the Boston area, but the number of specimens for Cape Cod, the Islands, and especially the Connecticut River valley is comparatively small. Farquhar’s comprehensive review (1934) lists only the locations of Framingham (H. H. Newcomb) to the west of Boston, Stoneham (C. V. Blackburn) to the north, and Amherst in "the valley" (H. H. Shepard). To locations around Boston were added Malden, Medford, Milton, Brookline and Forest Hills. For Cape Cod, there is C. P. Kimball's 1952 specimen from Barnstable (MCZ). However, for the Islands, Jones and Kimball (1943) report Sleepy Duskywing as “abundant” in the “plains area” of Martha’s Vineyard, and “common in the scrub oak region” of Nantucket. They cite several May 14, 1939 Vineyard specimens by L. W. Cleveland, which are now in the Yale Peabody Museum. Two Nantucket specimens (n.d.) are in the Kimball Collection of the Maria Mitchell Museum on the island. From the 1960’s, 1970's and 1980's, there are further confirmatory specimens, but only for eastern Massachusetts. William D. Winter collected specimens in Westwood (1966 and 1969) (Harvard MCZ), and C. G. Oliver collected it in Concord (1966) and at Blue Hills Reservation in Milton/Canton (1966) (Yale Peabody Museum). By the 1970’s R. E. Grey, L. F. Gall, and W. D. Winter had documented it for Dover, Medfield, and especially Plymouth Myles Standish SF (5/19/1974, L. F. Gall, Yale). W. D. Winter collected it in the scrub oak area of Concord, New Hampshire (5/11/1974 and 5/21/82, MCZ). Specimens from D. F. Schweitzer (4, 7 and 13 May 1988, Yale) confirm Sleepy Duskywing's presence at Middlesex Fells Reservation in Medford/Stoneham. Schweitzer also found it at Stonybrook Reservation in Norfolk (1988) and in Canton at the edge of Ponkapoag Bog (1987) (Yale). Sleepy Duskywing uses only scrub oak in Massachusetts, as far as is known. Leahy (1986-90 MAS Atlas) suggests that its only other likely host plant in our area would be dwarf chestnut oak (Q. prinoides), which likewise occurs in scrub/pitch pine habitat but is less common. The 1995-99 Connecticut Atlas found Sleepy Duskywing larvae in the wild on scrub oak (O’Donnell et al. 2007). In Massachusetts photographer Sam Jaffe found and raised a Sleepy Duskywing larva on scrub oak from the top of Chickatawbut Hill in the Blue Hills in the summer of 2009. Sleepy Duskywing is not among the "switchers" (Table 3); that is, it is not known to have adopted any new non-indigenous host plants. Sleepy Duskywing is very habitat-specific in its distribution, unlike Dreamy Duskywing. Evidence is not sufficient to say whether Sleepy Duskywing has increased or decreased in numbers in the state over the last century or so, but there has been loss of its sandy pitch pine/scrub barrens habitat, often to residential and airport development. MBC records 2000-2007 rank both Sleepy Duskywing and Dreamy Duskywing as “Uncommon” relative to all butterfly species; Dreamy is somewhat more frequently found than the Sleepy (Table 5). Sleepy Duskywing and Horace’s Duskywing are on the low end of Uncommon, whereas Dreamy is the third most frequently-found duskywing, after Juvenal’s (U-C) and Wild Indigo (U-C). The MAS Atlas found Sleepy Duskywing in 27 blocs, also terming it "Uncommon." An important list-length analysis of MBC data 1992-2010, published in the biological journal Nature: Climate Change (G. Breed et al. 2012), showed a statistically significant 104% increase in detectibility of Sleepy Duskywing over this period, compared to a statistically significant 53% decline for Dreamy Duskywing. As Dreamy Duskywing is more northerly in range and Sleepy more southerly, these findings illustrate the effect of warming climate on two key Massachusetts species. Analysis of MBC-reported sightings per total trip reports (Chart 76) also shows a marked increase in Sleepy Duskywing sightings over this period. Linear regression of sightings per trip report also significantly indicates increase, as does the raw number of butterfly individuals reported. Thus, four different metrics all point in the same direction for this species. While the increase is consistent with expectations derived from climate warming trends, it also may be partly due to increased numbers of observers on trips to Myles Standish SF, increased ability to identify this species, and increased reporting from Martha’s Vineyard. In other words, there may have been increased effort directed toward this species, which is not captured in the total of all trips, or even in list-length analysis. The 1986-90 MAS Atlas had found Sleepy Duskywing mainly on the southeastern coastal plain, Cape Cod and the islands, and “in a few scattered localities away from the coast where there is sufficient scrub oak” (Leahy). BOM-MBC records 1992-2013, shown in Map 76, largely confirm the Atlas finding but expand this species’ range in the state. The two largest concentrations of Sleepy Duskywing are on the coastal plain (Plymouth) and the islands (Martha's Vineyard), but the species has also been very frequently reported from Foxboro-Sharon-Canton-Milton area and from towns southeast of Worcester such as Holliston, Milford, Sherborn and Grafton and Shrewsbury. Sleepy Duskywing was reported from 42 towns in this period, compared to 94 for Dreamy Duskywing. The majority of Sleepy Duskywing reports in BOM-MBC records are from two main locations: Myles Standish State Forest in Plymouth/Carver, and Martha’s Vineyard State Forest in Edgartown/West Tisbury. Northeastern Massachusetts: single Sleepy Duskywings have now been reported a number of times from Newbury (Martin Burns WMA), Topsfield, North Andover and Gloucester in Essex County, and from nearby Chelmsford power line. 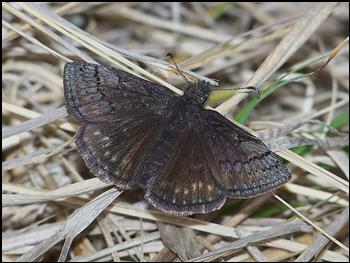 The Atlas had not found Sleepy Duskywing in Essex County, only as far north as Lynnfield and Medford at Middlesex Fells ( D. F. Schweitzer specimens). There are no historical records for Essex County. Central Massachusetts: There are now several 1992-2013 reports from Royalston Tully Dam. The Atlas had not found Sleepy Duskywing in the north central part of the state, nor are there any historical records. The Atlas furthest west towns had been Milbury and Westborough, both near Worcester. BOM-MBC records also contain many Worcester-area reports. Connecticut River valley: BOM-MBC records show reports of small numbers from several locations: Chicopee, Westfield, Belchertown, Northampton Florence, and Sunderland. This is consistent with the few historical reports. Berkshire County: There are no BOM-MBC reports from Berkshire County or nearby hill towns, nor any historical reports. The Atlas had no reports from the western part of the state at all, except one from Sheffield. There have been no 1992-2013 reports from Sheffield, although the area has been thoroughly visited. Cape Cod: MBC has reports from Truro, Wellfleet, and Falmouth, largely the same areas where the Atlas had found Sleepy Duskywing. Mello and Hansen (2004) also mention Tilcon in Eastham and Camp Edwards Training Site as productive locations. Islands: Sleepy Duskywing has been known on Martha’s Vineyard since the 1940’s and earlier, with Jones and Kimball (1943) reporting it as “Abundant,” in the “Plains Area” of West Tisbury. The Atlas confirmed it there, and MBC records contain Martha’s Vineyard Sleepy Duskywing reports every year since 1998, with peak numbers in double-digits: for example, observer Matt Pelikan reported 19 from Manuel Correllus State Forest on 5/14/2008. The Vineyard checklist ranks Sleepy Duskywing as “common” (Pelikan 2002). Historical records also exist for Nantucket, and F. M. Jones reported Sleepy Duskywing as “common in the scrub oak region May 3 – June 5” (Jones and Kimball 1943). Specimens are present in the Maria Mitchell Association Museum on the island. There are no MBC 1992-2011 or Atlas period reports, but contemporary observers regard Sleepy Duskywing as likely to be present (LoPresti 2011). Sleepy Duskywing is not reported on the July NABA Counts due to its early flight period. Only one or two individuals are usually found at most sites. The two locations which have yielded especially high numbers of Sleepy Duskywings are Plymouth/Carver Myles Standish SF (49 on 5/17/2008 E. Nielsen; 35 on 5/5/2013, B. deGraaf); and Edgartown/West Tisbury Manuel Correllus SF ( Edgartown SF, 20 on 5/15/1999 A. Keith and 4 on 5/18/2013, M. Pelikan; West Tisbury SF, 23 on 5/7/2010 M. Pelikan, 5 on 4/17/2012, M. Pelikan). Other good locations are Canton Great Blue Hill max. 5 on 4/22/1998 B. Cassie; Chilmark Menemsha Hills TTOR, 5 on 5/1/1999, M. Pelikan; Falmouth Crane WMA, max. 3 on 5/30/1997 B. Cassie; Foxboro Lamson Road, 3 on 5/2/2010, M. Champagne and B. Cassie; Holliston Brentwood CA, 3 on 5/11/2010, B. Bowker; Medford Middlesex Fells, 2 on 5/13/1996, B. Malcolm; Northborough Carney Res., 3 on 5/16/2010, S. Moore and B. Volkle; Stow Delaney WMA, 3 on 5/7/2000, B. Walker; Truro, 10 on 5/5/1997 J. Sones; Woburn Horn Pond Mtn., 2, 5/31/2004, M. Rines. Sleepy Duskywing is univoltine throughout its range, even in the south, and this factor may limit its abundance. Unlike Dreamy Duskywing, there appear to be no reports of any partial second broods (Opler and Krizek 1984; L. Harris 1972; Cech 2005). According to MBC records, the flight period here extends from mid-April to the end of June at the extremes, but the most numbers are seen in May (http://www.naba.org/chapters/nabambc/flight-dates-chart.asp). The peak flight period is earlier than that of Dreamy Duskywing, and shorter. Earliest sightings: In the 22 years of BOM-MBC records 1992 - 2013, the five earliest "first sightings" were 4/14/2012 Plymouth Myles Standish SF, M. Arey; 4/19/2002 Lynnfield power line, A. Grkovich; 4/19/1999 Easton Borderland SP, B. Cassie; 4/21/2010 West Tisbury SF, M. Pelikan; and 4/22/1998 Canton Great Blue Hill, B. Cassie. The effect of the unusually warm springs of 2012 and 2010 can be seen here. In nine of the 22 years, the first sighting of a Sleepy Duskywing was in April, rather than May. The remaining four late April first sightings are 4/27/2013 Edgartown, M. Pelikan and A. Keith; 4/29/2011 West Tisbury SF, M. Pelikan; 4/29/2001 Edgartown SF, M. Pelikan; and 4/29/2006 Shrewsbury, S. Moore and B. Volkle; The rest of the first sightings are in early May. The earliest date cited by Scudder for Massachusetts was April 27--- reported by Miss Guild in Walpole (1889:1506). But there are earlier museum specimens: in 1874, they were first reported in the "hundreds" on April 15 from Weston, and in 1897 they were found on April 25 in Waltham by Charles Bullard (MCZ specimens). A trend toward earlier sightings in the last 100 years is not discernable. Latest sightings: In the same 22 years of records, the five latest "last sightings" were 6/29/2003, Plymouth Myles Standish SF, T. Murray; 6/17/2000 Framingham Callahan SP, C. Kamp, 6/13/2004 Westborough, S. Moore; 6/12/1992 Foxboro, B. Cassie; and 6/11/1994, Milford, R. Hildreth. There were no reports in July. Sleepy Duskywing is a southern-based butterfly, and the numbers, breeding range, and emergence time of this species may be expected to increase in New England in response to climate warming, if habitat is sufficient (Table 6). Current BOM-MBC records already suggest some increase in the likelihood of seeing this butterfly in our state. The main threat to Sleepy Duskywing in Massachusetts is loss or degradation of its scrub oak/pitch pine barrens habitat. For many reasons this habitat is and should remain a conservation focus. Sleepy Duskywing is near the northern edge of its range in Massachusetts. It has been found in several townships in southern Maine during the 2007-2012 Maine Butterfly Survey, and is listed as a Threatened species in that state. (MBS 2/2012). Sleepy Duskywing is not, so far, found in Vermont. Sleepy Duskywing is a state-listed Threatened species in Connecticut. The 1995-99 Connecticut Atlas found only 4 specimens during the project, compared to 90 pre-project, and concluded that “the distribution of the Sleepy Duskywing contracted substantially in the last several decades,” due to loss of open oak woodland and barrens habitat (O’Donnell et al. 2007: 54, Table 6.2).